Remember my post about Organic Stonyfield yogurts and my advocacy for organic foods,I was elated again when offered a free sample coupons for Oikos Greek yogurt,that is fat free with 10grams of protein in a 4oz container and available in delicious flavors such as chocolate,honey caramel and blueberry. If the store were I shop had chocolate that would have been my first pick,but since it wasn't in stock,had to settle with blueberry as my next best choice.The blueberry oikos Greek yogurt blended with carrots and whey protein yielded one of the most delicious fat-free shakes by far,a perfect finish after a light afternoon or evening meal or even a nutritious start of the day. Blend all the ingredients in a Vitamix until smooth and frothy,keep cold until serving time. Wat a fabulous looking shake, beautiful and healthy shake to start a day.. Oh...I'm sooo doing this!! !Especially because I like carrots :)! A great shake! Very healthy and full of energy. Wow that looks sooooooooooo colorful and healthy shake...Wow yummy and healthy treat. A healthy and delicious shake! What a lovely smoothie - the color is so pretty too! So healthy and yummy looking shake. Loved the color . 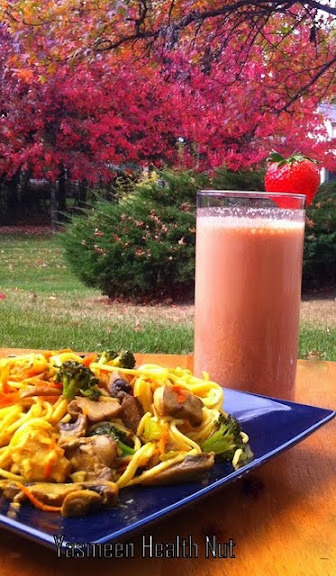 The protein shake and the pasta made me hungry - no kidding! It's something I would eat on a lazy afternoon and then read a book. Ah... relaxing! Yogurt in general is good for the digestive system and since, it's fat free, this is awesome! 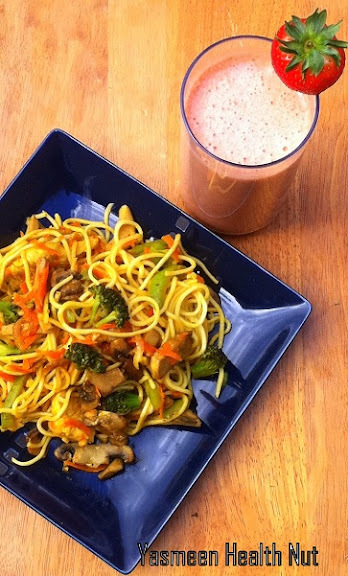 I have not tried this carrot protein shake, I am using protein shake of chocolate flavor that is really healthy and tasty. But after this post i like to see this and also want to try this. Thanks for sharing. Sounds yummy! But I can't take my eyes off the dish next to the shake :P haha It just looks really yummy!! Oikos is my favorite yogurt. Great way to make a smoothie with it. Wonderful shake.. looks perfect !! Well, this is my first visit to your blog.. But I admire time and effort you put into it, especially into interesting articles you share here..
Nice blog and juice recipe is so good.